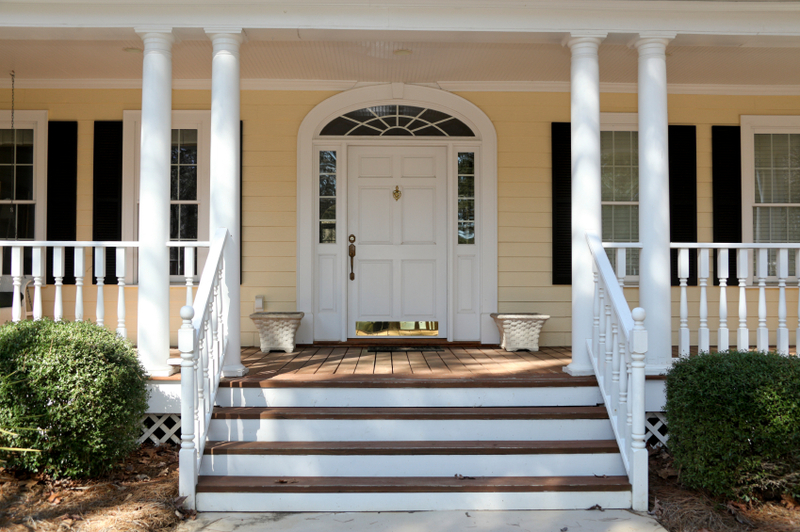 When you are preparing your home for sale, your front porch or door is an important element. Each one can be seen from the road when a potential buyer arrives to view the property, and they will be starting to form an opinion about your home and whether they can see themselves living in it. You’ll want to take steps to ensure that your front door and the pathway leading up to it (whether you have a porch or not) looks inviting. Spruce up your front door by giving it a fresh coat of paint. Consider choosing a bright colour that will draw attention to your home and make your door stand out from the other homes on your street. You can use tones like light yellow, golden yellow, red, and pumpkin on front doors to draw attention to your home. Other options you can consider are dark blue, blue-green, dark green, deep purple and grey-blue. One you have applied new paint, complete the makeover by changing out the door hardware. Replace the door knob and lock with a new handle set. You can find them in a number of finishes to suit your new colour, including brass, nickel, chrome, pewter and iron. Even the smallest porch area can benefit from a boost of colour. Coordinate with your new front door by adding colourful mats or an indoor/outdoor rug (make sure they are slip-resistant). They will help to keep dirt and dust to a minimum from visitors entering your home, but also give the impression of “finishing” this space. Hang flower baskets, place potted plants or build up your flower beds near your porch area to make this an inviting part of your home. Choose plants and flowers that will coordinate or contrast with the colour you have selected for your door. You don’t need to have too many colours when trying to sell your home to make a statement; choose a couple that you like that work together and plant them. As experienced realtors, Daniel and Bonnie Wan can offer you valuable tips and hints on how to sell your property quickly and for top dollar Contact them today to start working with the right Wans! This entry was posted in Home Staging and tagged Home Selling, home staging. Bookmark the permalink.